Last Saturday night we had about 70 CSA members and friends at the farm for our harvest dinner – a great turn out! We spent a couple days clearing out our hayloft to set up tables for the event to squeeze everybody in. I have to say it looked pretty cool. I do wish all our CSA members were able to attend since the harvest party was just one small way to thank you for being members for the season. Like I told those in attendance, we honestly would not be able to do what we do without CSA members. Your making a decision to get your veggies in a way other than at your local grocery makes our farm viable. With only a roadside stand or a stall at the farmers market, market gardening is a volatile, and, frankly, brutal business. However, CSA members across the nation take the risk when writing a check in the spring that a tornado not destroy the crop and trust a local grower to provide an ample harvest. This makes not only our farm a reality, but also hundreds of other small farms just like our own. When a couple farms in upstate New York began the first CSAs in the early 1980’s, this was time when the family farm seemed doomed, especially here in the Midwest. Operations were foreclosing left and right in the farm crisis. Today, however, small family farms are making a comeback, albeit in a different form. Many of us may not operate traditional 40-head dairies or 160-acre row crop farms, but our heart is in the land just the same. So, if you are a CSA member, take pride in knowing that you are not just “part” of a movement, you ARE the movement. Brussel Sprouts on the Stalk: Simply pull the brussel sprouts off the stalk and put to work. I don’t know what to do with the stalk afterwards…croquet mallet? Parsnips: Look like white carrots. Butternut Squash: These turned out really well this year. Good color, good size. Red Kuri Squash: Cook as you would any other winter squash (buttercup, etc). We made a coconut squash soup last night with Red Kuri and it was excellent. We thought a good description for the squash was nutty, almost chestnut like. HaralRed Apples: These are pretty good for fresh eating (a bit sweeter than a Haralson), but, like a Haralson, are great for baking and sauce. 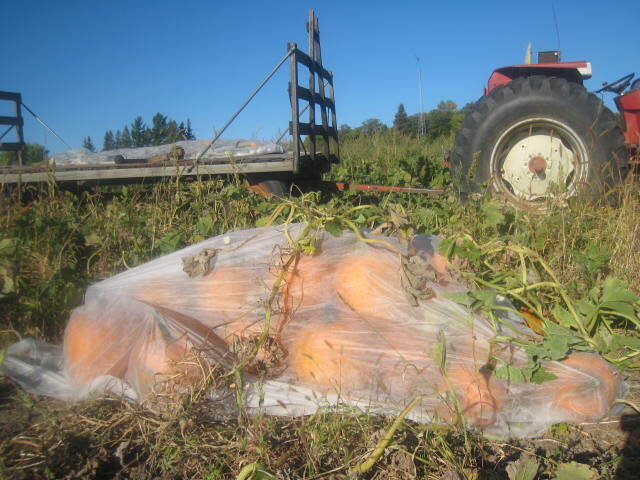 This has been a annual night-time ritual for me – covering winter squash and pumpkins in the field to save the crop from frost. 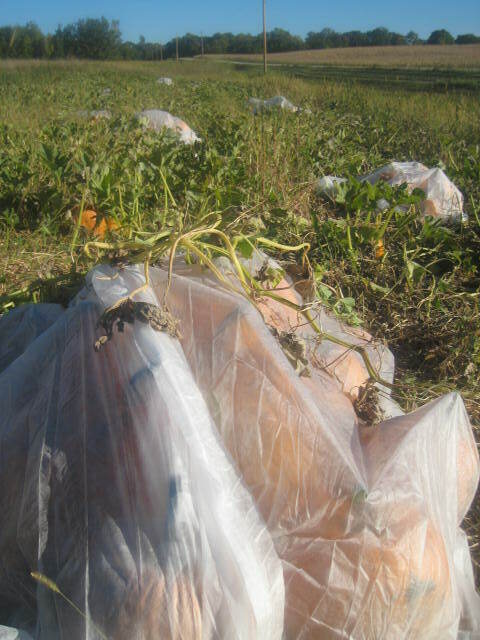 While you were getting ready for bed last night, I was outside laying a row cover fabric over big piles of squash in the field. My only light to work by was two headlights from a van pointed in my direction and the only sound that whiny whirl of a van with too many miles on it. I don’t know why and it seem strange to say, but it’s such a peaceful and magical ritual for me. As I’m outside tramping around these dried up and crunchy squash vines and the temperature dropping minute by minute, I feel the presence of those who worked the fields before me; they look over my shoulder, trying to get close to the fall harvest they miss being a part of. Covering squash also seems like some kind of strange early Halloween ritual. If you drove by our place in the evening, all would appear normal, only to find a field of white ghosts the next morning. Almost like I was out playing a trick on passer-bys. After all that work, however, it looks as if the yesterday’s frost bell was a false alarm. Maybe there was some frost in really low-lying areas, but everything looks just fine. I think yesterday’s heat and sun really helped warm the ground which protected us with some extra night-time degrees. Still, next week looks quite cold, so the rush to continue pulling in produce will continue through the weekend. 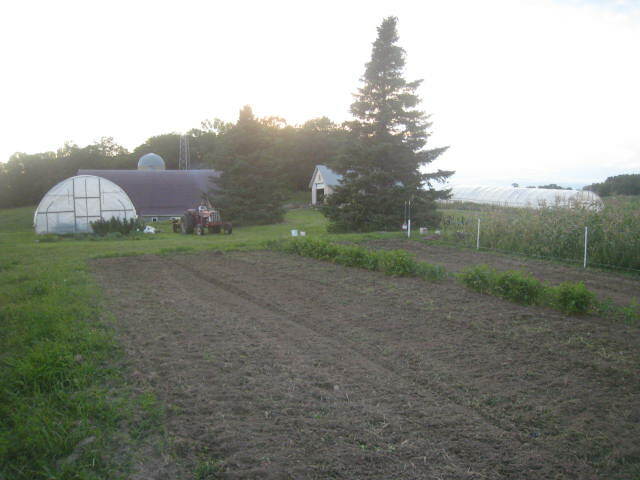 I invite all CSA member out this Saturday evening and Sunday afternoon and evening to glean tomatoes and peppers. There are a lot out there and I want to give them a home instead of rotting on the vine. At the end of the season, these aren’t the prettiest, but this is a good opportunity to get a good amount of peppers for freezing or tomatoes for canning. No charge – it’s a perk for being a CSA member! A reminder to CSA members to RSVP for the harvest dinner on the 22nd. I do thank those of you who offered to make something, but this is not a potluck, so I do not expect people to bring something to pass; we’re making arrangements. We’ll be working to transform our hayloft into a dining room, so let’s see if we can pull it off! Rutebega: The thing the size of a bowling ball. Don’t worry though, rutebegas, unlike other veggies like turnips, can get really big without getting woody. They will also keep in your fridge for 6 mos. Summer Squash: You could see green zucchini, yellow zucchini, or pattypan squash. However you prepare zucchini, you prepare other summer squash the same way. Celery or Celeriac: Most people got celery, but some got celeriac, which looks like an ugly hairy root with a little stalk on top. You use celeriac the same as you would celery (tastes the same). 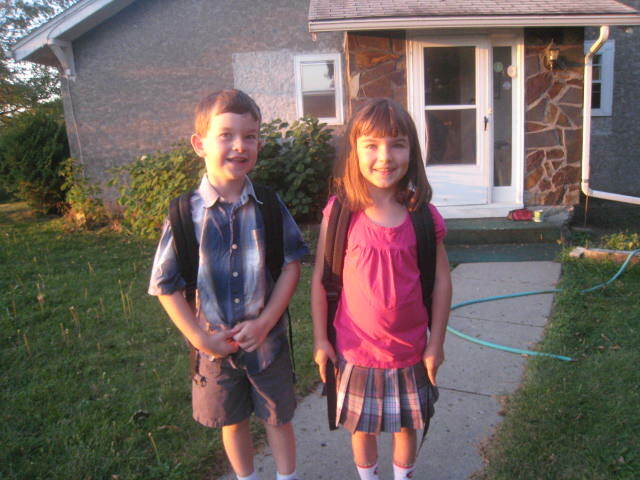 On Tuesday Willem had his first day of kindergarten and Sylvia her first day of second grade. Each year this always brings a new vibe to the weekly harvest schedule. Typically I get up early, down some coffee, and trounce out the door before 7 to harvest produce for the box. But now, I get up early to first argue with some kids about getting dressed and driven into town before getting down to work. Sure, this slows me down a bit, but the change of pace seems to fit the season. I think we all feel this change this time of year, whether you have kids in school or not. Mornings are cool, leaves take on a certain crunch, and, at least on the farm, the work schedule slows a bit. We still have a lot of work to do, but get more relaxed about it. Summer, especially late July through Labor Day, is total madness on a produce farm, a constant fever-pitched fight day in and day out, dragging in crazy amounts of veggies in uncomfortable heat while trying to plant, battle weeds, irrigate, and juggle animals, special orders, pick ups, a farm stand, farmers market…you get the picture. I go on about summer work not to say I hate high season. On the other hand, I relish it. I love the “let’s-roll-up-our-sleeves” attitude necessary and adrenaline-powered feeling I get jumping into the whole craziness of it all, knowing all well that it’s a 6-8 week push which has an end. Here at the end of high season is the time to take on canning tomatoes or freezing peppers in bulk if you’re going to preserve. In about a week, frost is very much possible and it’s game over. So don’t call me in a week, it’s best to make arrangements now. We sell full bushels of tomatoes for $35 (about 50 lbs). We also have peppers which are seconds which we’ll sell for a discount. Let us know by contacting us at lidafarmer@gmail.com or 218-342-2619. Announcement: All members should have received a flyer in the mail about our upcoming Harvest Dinner at the farm on September 22. Please feel free to bring family members, spouses, or a guest along to the dinner. Simply RSVP by September 15th so we know how many to prepare for. Sweet Corn: The last hurrah from this little patch I planted late. Green Zebra Tomatoes: We typically mix reds and zebras together for salsa. Sweet Peppers: A whole mix yellow, red, green, and Italia-type since we have so many coming on the plants. If you are unable to use them and want peppers deep in the winter, simply slice, put into a freezer bag, and throw in the freezer. Peppers are the easiest of veggies to preserve and blanching is not necessary. Cippolini Onions: You ever see those long braids of onions at an Italian restaurant? Typically those are Cippolinis, a nice-flavored onion you cook with. Snap Peas: Edible pod, so don’t shell them. Bok Choy: See video below on how to prepare. Generally this is a basic stir fry recipe, so feel free to adopt to include the veggies you like (those peas would good well with this).